Microsoft Access combo boxes let you display data for users to select values from predefined lists. Using them effectively simplifies data entry and accuracy. Most commonly, the list of values is from a table or query, and can be bound to one field (like an ID field) while displaying a field the user sees and understands. Combo boxes in Access also support the display of multiple columns so you can show more data to make it easier to select the right item. 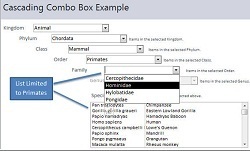 Brush up on the ComboBox Basics from Microsoft, and check out our Top Five Tips for using Combo Boxes on Microsoft Access forms. Each has articles describing them in more detail. LimitToList: Set this property to Yes to prevent values that are not in your list. AutoExpand: Set this property to Yes to automatically select a matching value in the list as you type. ListRows: Set this value to a high value so that the drop down shows as many list items as space allows. In forms, the BeforeUpdate event is used to validate the entries in the current record. For Combo Boxes, people often check if the value exists by looking for Null. This works in most cases, but not all. If the combo box is on a bound field, there may be an existing value that is not valid. For example, the value may have been in the list when it was originally selected, but the current list of allowed values has changed. If you simply check for IsNull, Access says it is not null. This is accurate, but what you really want to know is if a valid value was selected. MsgBox "A value is required for ...."
This lets you default to the first value and rely on the value in the current list rather than hardcoding a specific value. For data entry of addresses, we like to speed data entry and improve accuracy by forcing users to select countries from a combo box list, along with state if it's a country with a state list. Additionally, we use a zip code lookup table to fill in city and state values. This improve accuracy by eliminating typos on city names and flagging wrong zip codes if the city doesn't match. Copy and Paste a Command Button on a Form without Losing the Picture NEW!